Harbour Town Docklands is one of the newest areas of Melbourne and is located 2km from the Central Business District. Harbour Town is part of the ongoing evolution of the former Docklands area of Melbourne. The Harbour Town Docklands is now home to apartments, a shopping centre, Costco Docklands, bars and brilliant restaurants. Docklands restaurants are very popular for dining. For the whole family, there is the amazing Melbourne Star and the O’Brien Group Arena where we were headed for an Ice skating Docklands Melbourne experience! Melbourne attractions are poping up everywhere in this area of the city. The O’Brien Group Arena opened in 2010. It was formerly known as Medibank Icehouse The Arena is home to two Olympic-size ice rinks. One of the rinks has stadium seating and is enclosed for activities such as Ice Hockey. The Stadium, after all, is home to the Australian Ice Hockey Team and the Olympic Winter Institute of Australia. The day we attended the Arena there were men’s and woman’s ice hockey matches going on. We have not really seen this sport before so as we walked in we all took some time to watch for a little bit but after what seemed like seconds, the girls were well passed waiting to get on the ice themselves. Wyld Family Travels ice skating Melbourne Docklands adventure was about to begin! Willow and Marley could not wipe the smile off their faces when we announced that we were going Ice Skating. The girls had been asking for such a long time to go. You see Ice Skating just does not happen in Australia. It is not cold enough for any lakes to freeze, so we would need to make a 2 hour trip in the car to reach the O’Brien Arena. 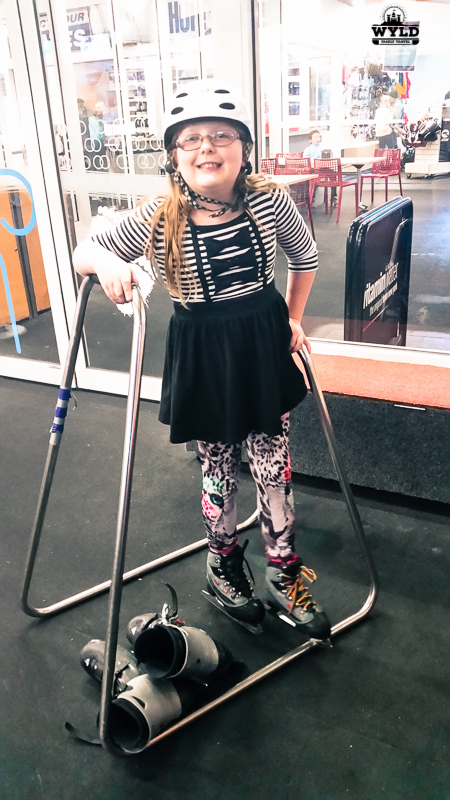 The girls have never done any kind of skating before, even on our overseas adventures, so we got our skates and hired some skating aids to help. 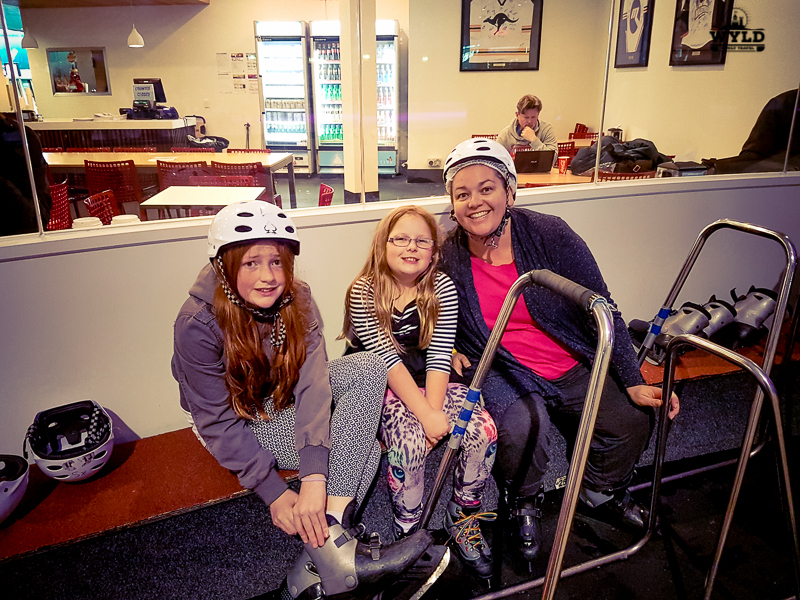 With squeals of delight and some ‘oh my goodness, it’s cold in here’ (I am not sure what they were expecting at all) we headed over to put on our skates. At this stage, Bec and I debated who was heading out on the ice with the girls, but finally, the decision was made that Bec would be the lucky one. The rationale was that I work more so we could not afford for me to break a bone if the worst would happen! Even though there were lockers available to store our belongings in we both thought it would be a better idea to have one parent on the sidelines to rescue a child or the other adult if need be. As we were watching people slip and slide all over the place the natural instinct that Bec would do the same worried her. For someone who did not want to skate, Bec looks pretty happy! The rink was pretty full at this stage, there were plenty of adults and kids alike really enjoying themselves. There were plenty of people in groups, families together and also plenty of people who knew exactly what they were doing! Disco lights were on and the latest hits were pumping through the sound system as the girls slowly crept onto the ice. The girls both had metal frames for helping them stand up. These were a fantastic aid especially for people who had not skated before or had very little experience. It gave you some sense of balance and some confidence to go out and have a try! Willow managed to make her way around the outside of the arena while Marley seemed to drift out into the middle. Marley looked lost turning in circles. This is when Bec entered the fray on the ice at O’Brien. There were a few dicey moments for Bec but like a duck, to water, my wife took to the ice with not quite the grace of Katarina Witt. Using the metal frame that sort of looked like a walking frame she headed out to try and save Marley from the middle of the arena where all the experts seemed to be heading! Once pointed in the right direction and guided back out to the side of the arena Marley was much more confident. Willow, on the other hand, was zipping around and had already completed a lap while Bec was struggling to get Marley to go in a straight line! Thank goodness everyone there was understanding of the complete lack of control Bec seemed to have over her and Marley’s direction! There were only tears once when Marley hit the ice hard and hurt her arm which we think she actually did on the side of the rink on her way down trying to catch herself before she fell. We were also really happy that helmets were supplied at the Arena and we had asked both the girls to wear one just in case. So tender hugs from Dad and some encouragement and she was quickly back out ice skating Docklands. As Marley got more confidence out on the ice we hired the girls a ‘seal’ This was another skating aid that both the girls loved. Marley could sit on the seal and Willow would push her around. Watching them laugh and just have a heap of fun together was great for both Bec and I. After 2.5 hours it was not the kids who did not want to leave it was Bec! She was right into the ice skating and enjoying the experience. The worries Bec had had when we first arrived had very much gone out the window once she had become a little more confident! Get your tickets for the Melbourne Start Here. Experience a single 30-minute flight in a fully enclosed, air-conditioned cabin that will take you 120 meters above Melbourne. The Melbourne Star Observation Wheel is the only giant observation wheel in the Southern Hemisphere. 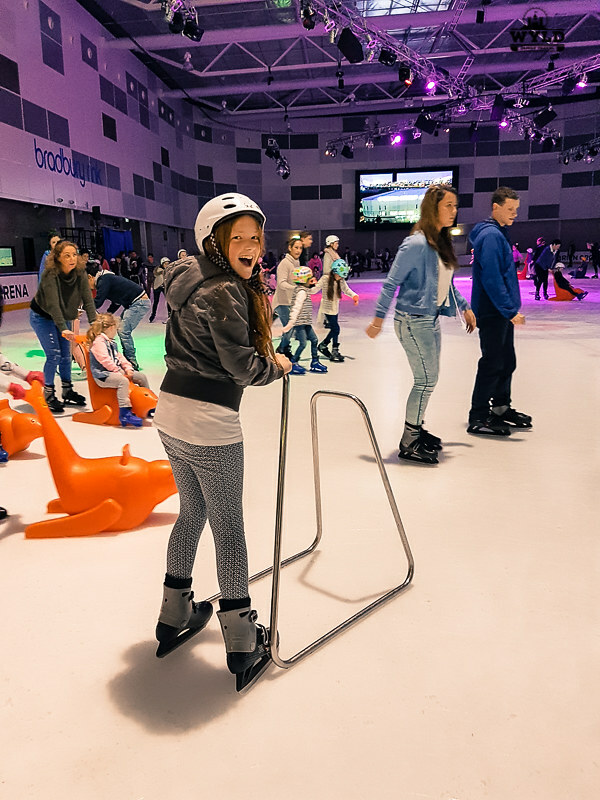 5 Family Tips to having a great day Ice Skating Docklands at O’Brien Arena! 1. Take some extra socks! I had completely forgotten to take socks and ended up having to borrow Mark’s! Then after I had finished skating for two hours he definitely did not want them back! 2. Dress in appropriate warm clothing. I must admit I was surprised at a number of people in skirts and short shorts who to me looked freezing! I was glad that both the girls had good clothing on and that I had a spare set of clothes in the car. 3. If you hire a seal or a metal frame look after it. Some people are not aware that you have hired them and will just come over and try to take them. Plenty of times we had to direct people over to the place where you get your skates to hire one. You also have to wear a helmet if you are using a metal frame. They are supplied and there are plenty of different sizes. 4. There are people skating around who will help you if you get into trouble. We found on the day we went that it wasn’t only the employees who were skating around that helped us it was also the skaters that knew what they were doing. It was really great to see them stop and help others who were not as confident! 5. If they are offering a free lesson try and take it! While we were there a call came over the loudspeaker that a free beginners lesson would be held. Both the girls went down the end to try and see how they went. It didn’t go for long but gave them some of the basics and had them trying out those moves for a good while after it! Catch the free city circle tram (from Flinders Street) or Tram 30 (via La Trobe Street) to the corner of Harbour Esplanade and La Trobe Street and walk along the promenade to Waterfront City to find Ice skating Melbourne Docklands at O’Brien Arena. OR Tram 48 (via Flinders Street) or Tram 86 (via Bourke Street) to the Waterfront City tram stop. Harbour Town Docklands is less than 2 minutes drive from City Link via the Docklands Drive exit. – Limited public street parking is also available. When staying in Melbourne we use Hotels Combined for all our accommodation needs, so should you! Looks like a lot of fun! I grew up in partly in upstate NY, ice skating is a fond memory of my teenage years. This brought fun memories. Bet your girls will always remember it. 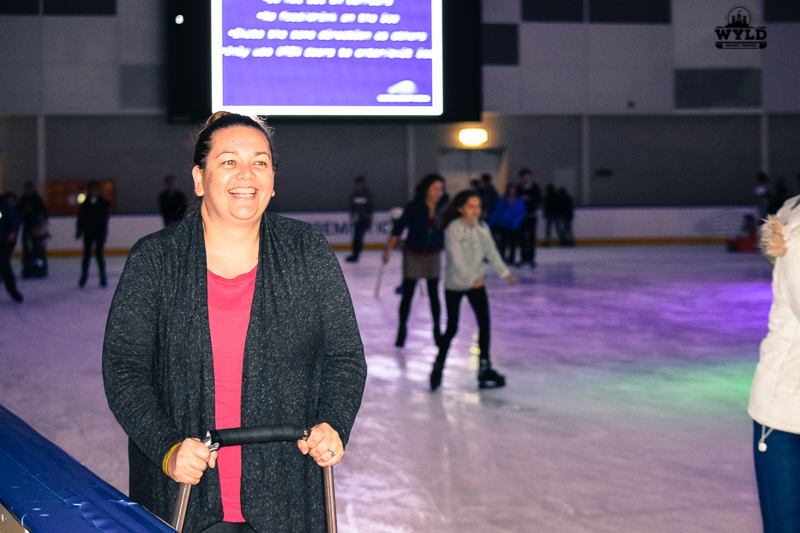 It sounds like you had a wonderful day out ice-skating in Melbourne and I love seeing all those smiley faces in the photographs! I am not great at ice-skating though and have bones made of glass lol. It’s been way too long since I’ve been Ice skating. It’s not something I really think of when I think of Melbourne though – will have to give it a try when I am there! Sounds like a really fun day. Reminded me of the first time I learned to skate. I couldn’t believe how cold it was in the arena- I wish I had worn two pairs of socks! Seems like an awesome day! Although here in Bulgaria isn’t warm all the time, I’ve been ice skating only once. Here there aren’t any metal aids to help out the beginners though which is very thoughtful, I must say. I will definitely take in mind your advises for next time! it would be very hard without the skating aids if you are a new comer to the sport. I used to love ice-skating when I was younger but now I’ve got the fear and am too scared to get back on the ice! I should try again though, it does look like fun. And nice to get some cool in hot Melbourne! I have not gone ice skating in years! How fun. And a great way to stay cool, at least for a few hours. Sounds like fun! 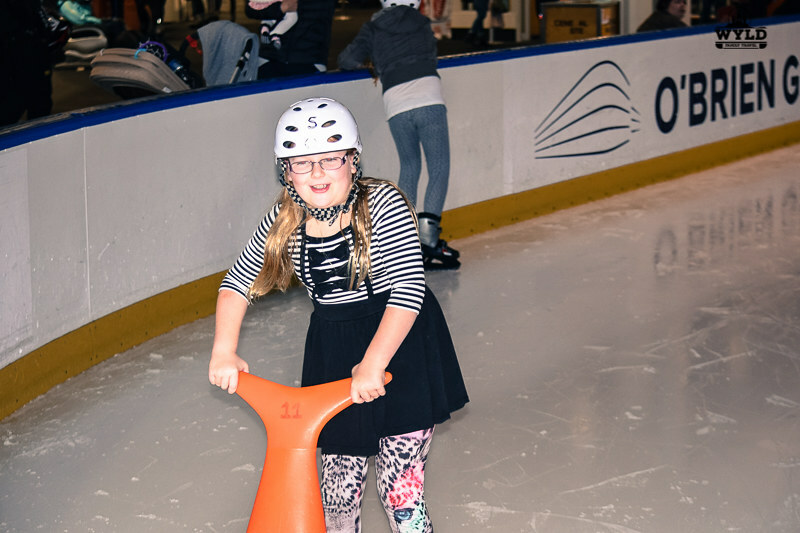 We’re heading down to Melbourne in December for the Christmas Carols, so will plan for a family fun day at the rink too! Great tips on the extra socks .. I would also add, wear long socks too so the skates don’t rub your ankles. I never knew how fun skating rinks could be until I went last year volunteering with an orphanage! The kids were pros and were helping me around! I think i may have needed one of those assistance props your girls had. You’re not kidding about those extra socks! Melbourne has it all! I am getting the kids skilled up in London before we move back to Melbourne so they look way better than I do staggering around the rink. Nice tip about the socks! I haven’t ice skated in a long time. In Bangkok I think there are like 3 shopping malls that have skating rinks. It was a lot of fun and good tips on what to bring or look out for.